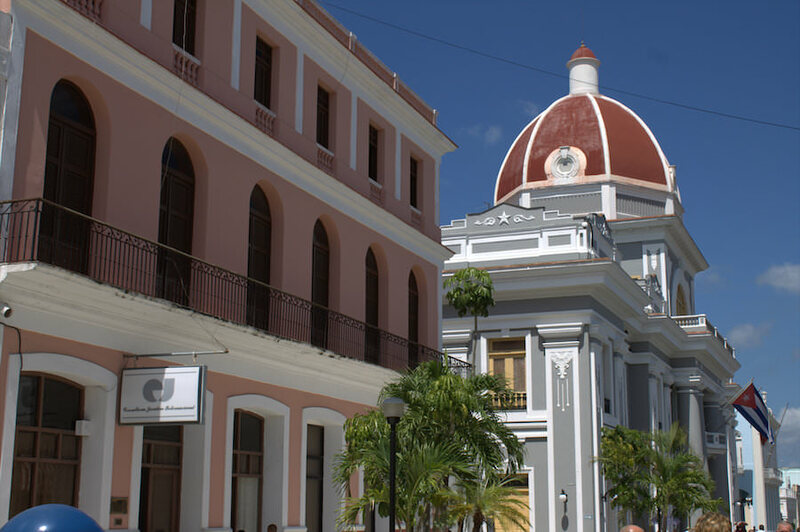 Situated on the Caribbean coast of southern-central Cuba, Cienfuegos is a compelling place to visit. With its colourful facades, wide streets and charming French colonial architecture, it rightfully deserves the Perla de la Sur (Pearl of the South) title. Founded by the French in 1819, Cienfuegos is one of Cuba’s newest settlements and feels quite different to the rest of the country. So don’t leave this picturesque town off your must see list when planning to travel to Cuba. The easiest option is to jump on ViAzul bus which criss cross Cuba to provide a decent, reliable transport network. They are generally modern and clean but can have vicious AC so remember to bring a sweater or top. From Havana 2 busses leave daily for Trinidad and stop at Cienfuegos half way, the journey takes around 4.5 hours. They can get full up pretty quickly during the high season so buy your tickets in advance. Have your passport ready to show at the ViAzul bus station in Havana (Nuevo Vedado area, Ave26, opposite the Zoo entrance) to buy the tickets a day before travelling. From Trinidad the trip takes around 1.5 hours. We ended up going via Santa Clara which took around 4 hours because it was Sunday apparently. 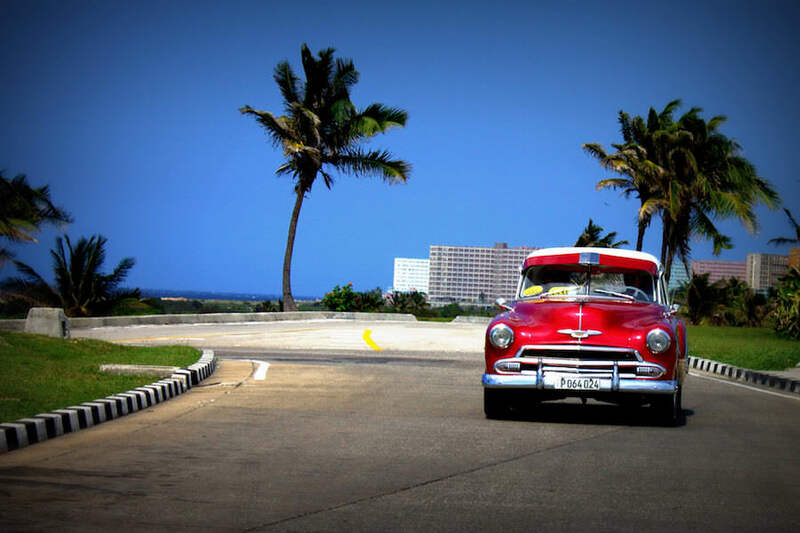 A little tip here, try avoiding travelling on Sundays in Cuba! The ViAzul Bus Station in Trinidad is located on Gustavo Izquierdo, between Simon Bolivar and Piro Guinart, in the Historic part of Trinidad. You can try taking the train from Havana, but the trains in Cuba are painfully slow and prone to breakdowns or cancellations. From the information available it seems to take 10.5 hours to travel from Havana to Cienfuegos by train. For up to date information check the excellent seat61.com rail website. If driving, beware that some turns aren’t well sign posted and the road can suddenly end, without any warning. You can also fly to Jaime González Airport in Cienfuegos from Miami, USA but be aware of strict visa restrictions. 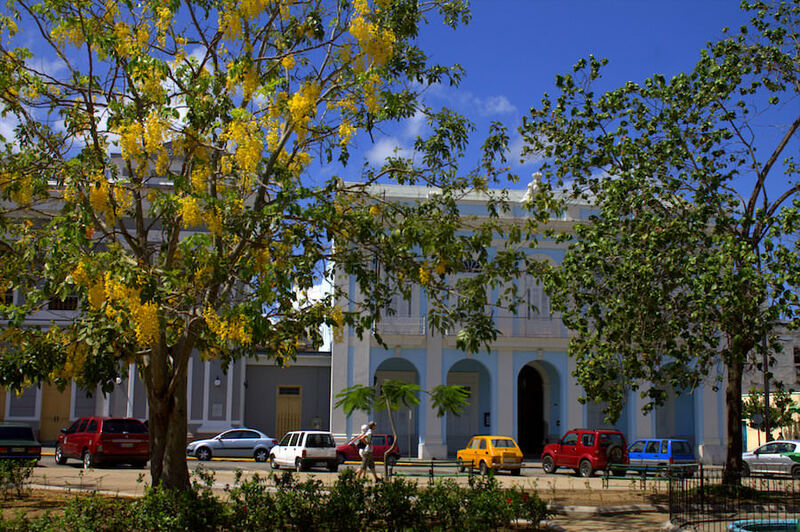 The Cienfuegos urban historic centre is framed with bountiful amounts of gorgeous French architecture and there’s nothing quite like it anywhere else in the country. We recommend spending a chilled afternoon at least to explore this exquisite UNESCO World Heritage Site (since 2005). 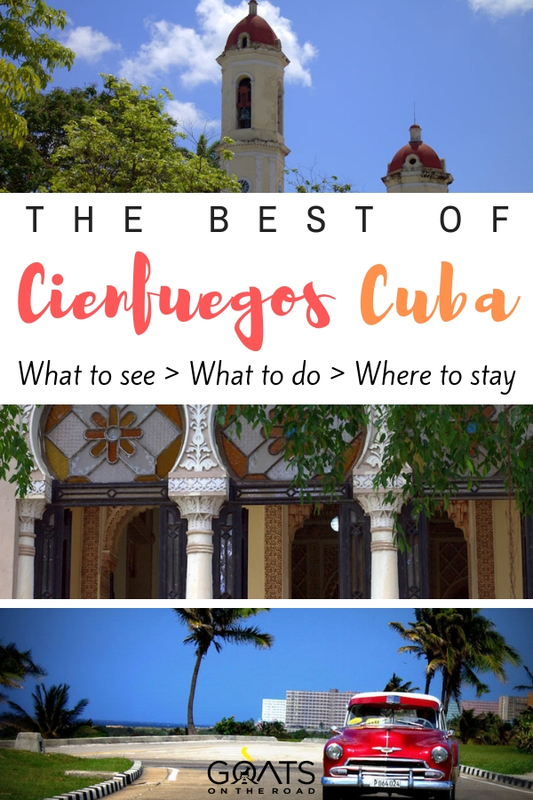 Start with checking out the Cienfuegos Boulevard, the longest in Cuba and pay attention to the beautifully painted facades. Spin around in the gorgeous Jose Marti Square and inhale the gracefulness of the historically significant monuments. Spot the one of a kind Arco de los Trabajadores (Arch of Triumph) dedicated to Cuban independence. 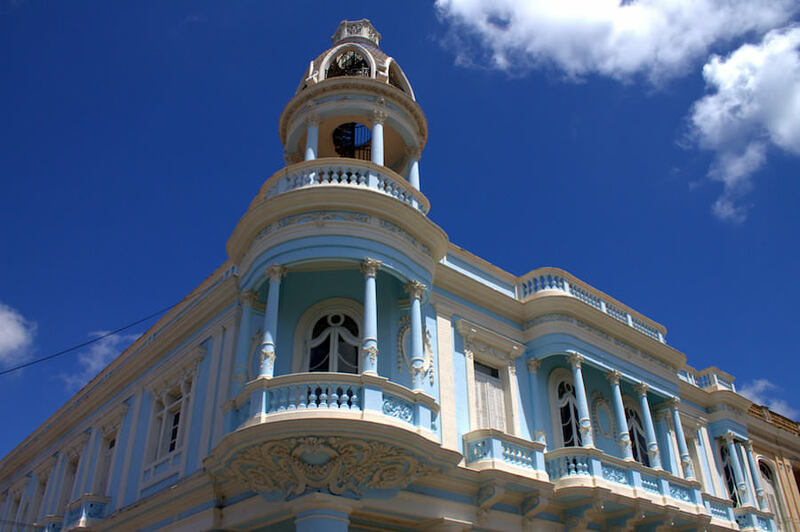 As you stroll the sunny streets of the city, don’t (not that you will be able to) miss the striking baby blue mansion on the western part of the Parque Marti. It’s the former Palacio Ferrer, designed by the local architect Donato Pablo Carbonell and completed in 1918. To the south of the park, discover the grandioso Palacio de Gobierno, the Government Palace, hence no admission for general public here. This charming Italian style theatre on the northern side of Parque Jose Marti is one of three vernacular theatres in Cuba. It was made a National Monument in 1978 and won an Award of Conservation in 2008. The prices in Cuba are quite reasonable and for just 2 CUC you can wander inside and investigate the grandness of this monumental building and especially the the 950-seat auditorium. 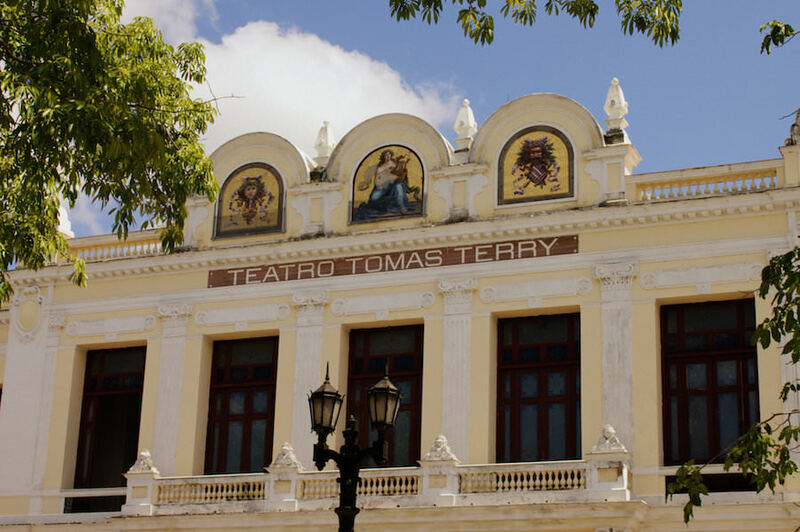 Check out the atmospheric Teatro Cafe Terry sitting between the Teatro Tomás Terry and the Colegio San Lorenzo. 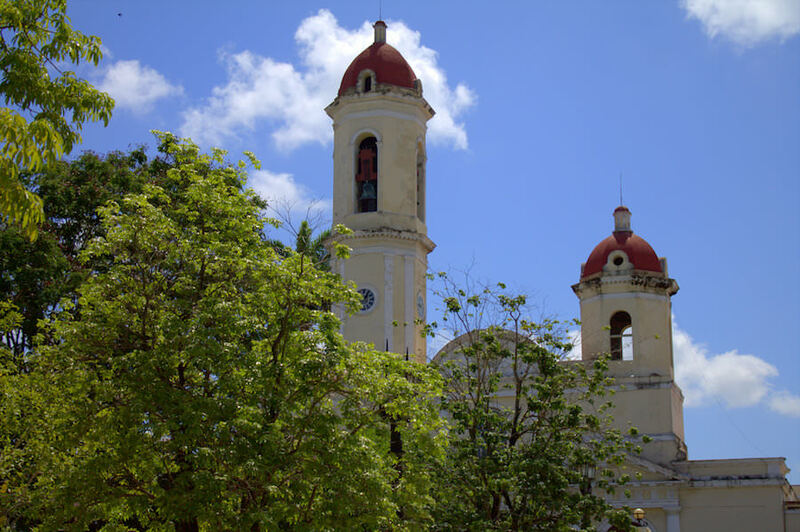 Do wander into this marvellous Cienfuegos Cathedral opposite the Martí Park. The building dates back to 1869 and its French stained-glass windows are especially stunning. You might wonder what Punta Gorda is. In a nutshell, it’s the upper-end neighbourhood of Cienfuegos. It’s around 3 km away, but easy to reach on foot by following the Malecon sea wall. If you are not up for walking, simply jump into a cab or hale the iconic Bici taxi (a bike taxi). 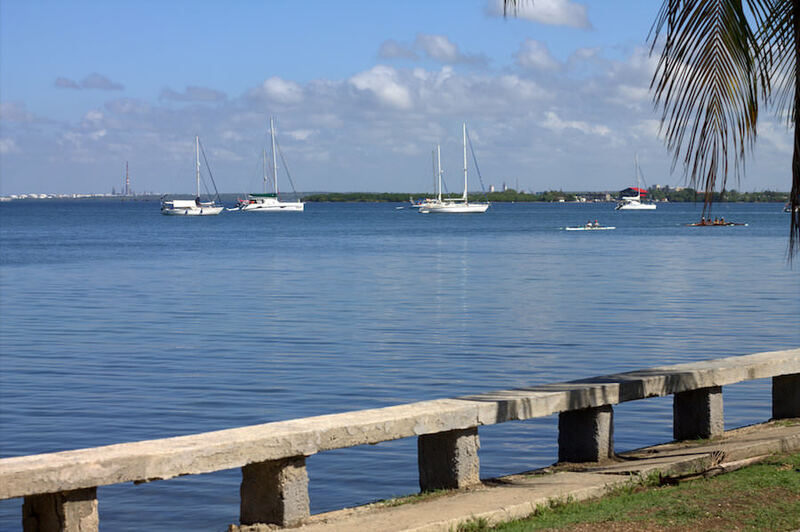 Situated at the edge of the Bay of Cienfuegos, Punta Gorda is truly gorgeous. We stayed at the end of the peninsula, and absolutely loved it. The place is so peaceful and has an interesting selection or architectural pieces as well as beautiful marina. 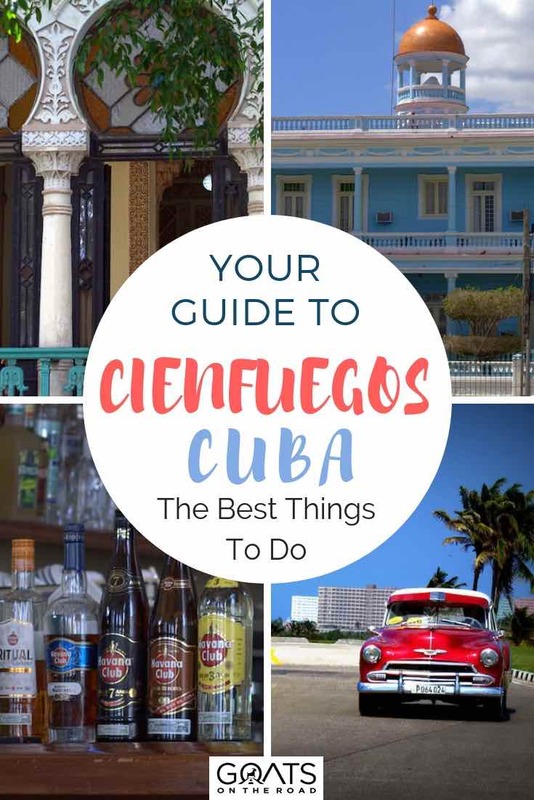 For a full on Cuban disco with flashy neon lights, live music and incredible Salsa moves, pop into the gorgeous Cienfuegos Club. Even if you can’t dance, enjoy the soulful sunset with a cold brew in hand. Cienfuegos Club might be a sports-bar-like place, but it has some fantastic views across the marina. Check out their lunch, dinner, snack or drink menu. A beautiful place to chill out for a cup of coffee or even lunch surrounded by crisp white linen, flowers and the sea breeze, if you are prepared to splash out. If you love sea, you can book a boat tour around the bay or arrange a deep-sea fishing trip. Try booking through Cubatur/Cubanacán. You can also find approved tour operators in the nearby Jaguar Hotel. 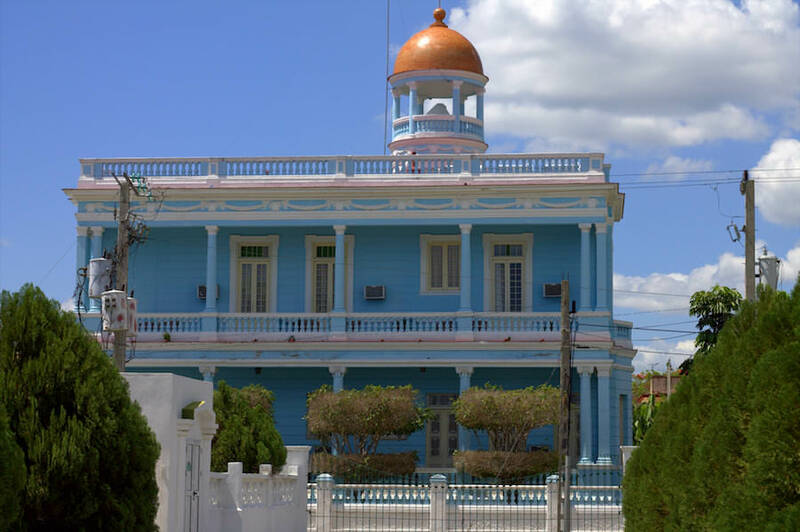 There are many options in Cienfuegos and Punta Gorda, from simple casas to visas and historic buildings. It all depends on your taste and budget. If you want to experience a unique stay with a local family consider booking a casa particular in Cuba. Painted in stunning blue, Palacio Azul was built in 1921 to poise Punta Gorda. The eclectic palace is now renovated into a quaint hostel. 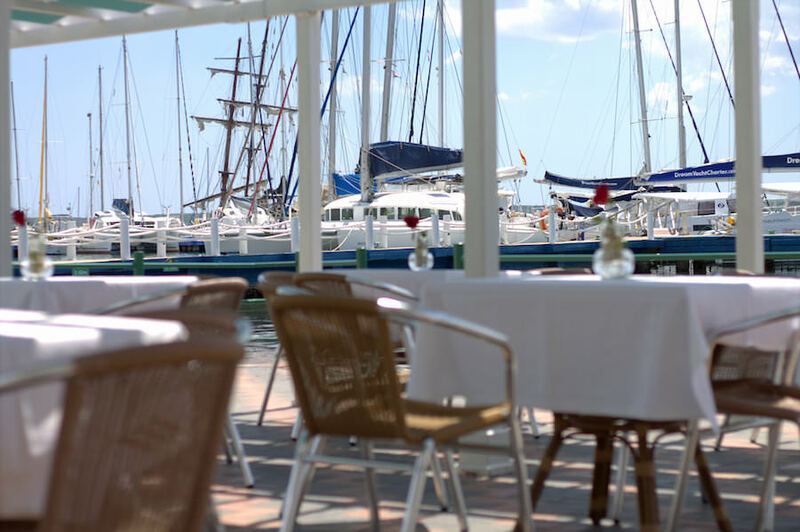 It offers panoramic views across the marina and only has 7 rooms so make sure to book in advance. The building itself is worth investigating, even if you are not staying there. For a touch of Cuban luxury, stay at Villa Lagarto. 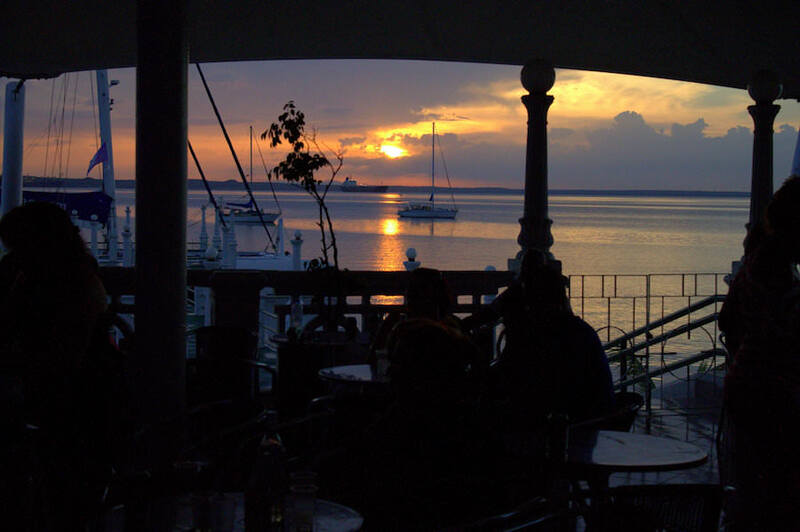 Situated at the end of the peninsula, it provides a peaceful stay with beautiful view into Cienfuegos Bay. The rooms here are small, but clean and cosy. 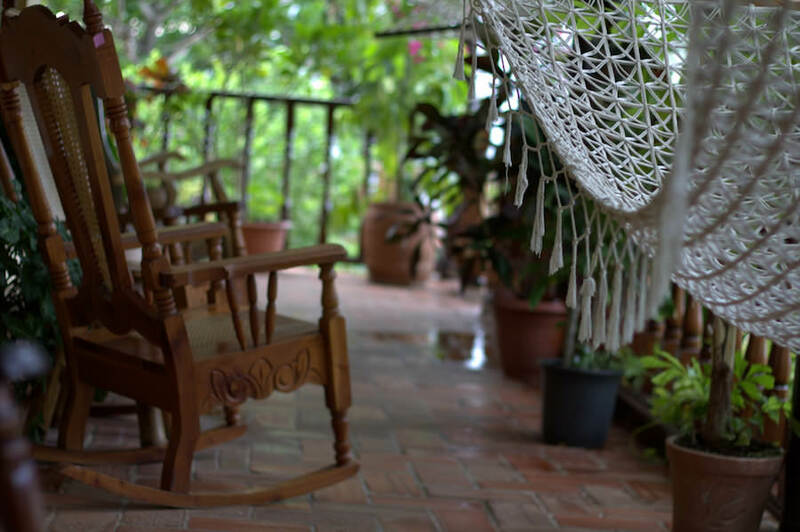 The upper floor has a beautiful terrace with hammocks and rocking Cuban chairs. Just imagine a combination of a rocking chair, delicious Pina Colada and stunning views. The staff here are marvellous and make wonderful cocktails. The food here is great too. The restaurant, as we found out during our stay, is one of the top restaurants in town. We enjoyed lovely breakfast, lunch and sometimes dinners here. 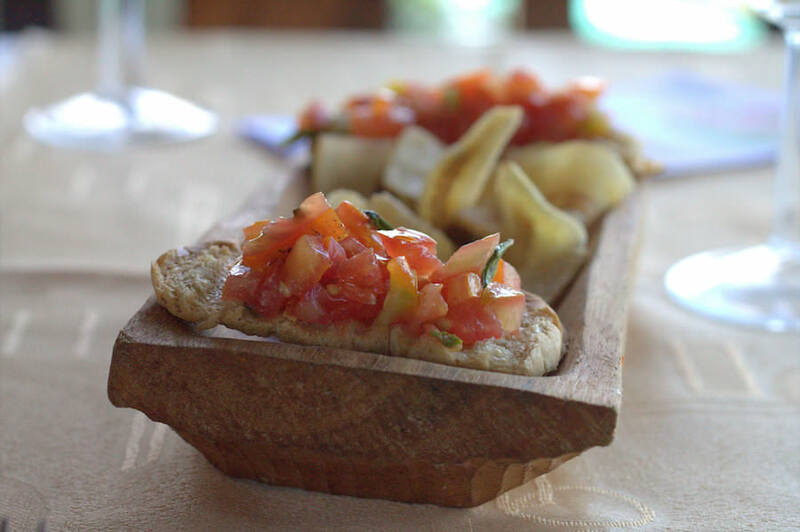 As previously mentioned, head to Villa Lagarto for some food extravaganza. If you want to splash out on lunch, they have a fabulous 7 course menu which includes some wonderfully cooked and presented dishes, with a sinfully sweet banana liquor in between courses. As you know by now, Cienfuegos is anything but like the rest of Cuba and dining options in in the classic neighbourhood of Punta Gorda are not an exception. As you approach the end of Calle 37, you are in for another architectural surprise. 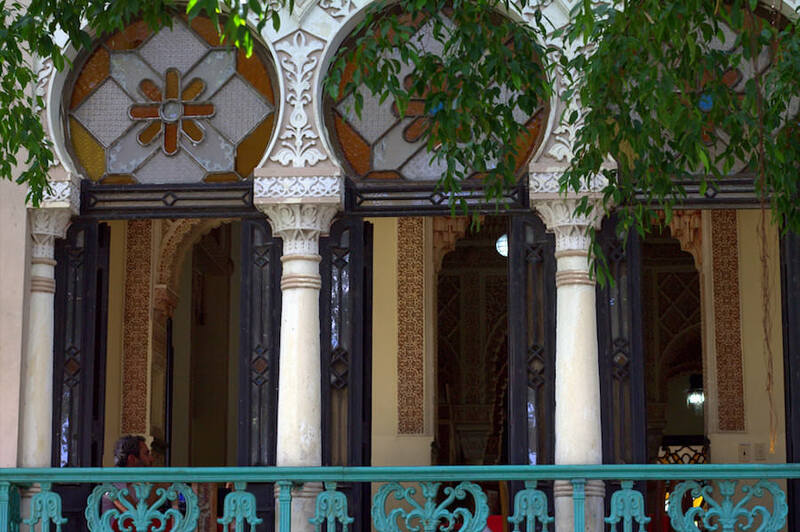 This extraordinary ‘One thousand and one nights’ looking palace was Built by a Spaniard Acisclo del Valle Blanco in 1917 and now houses a luxury restaurant. Pop in for light lunch and visit the terrace for lovely views. For cheaper eats, walk along the Malecon and you will find little random stalls grilling mini burgers or the Cubans selling bags of popcorn in the evening. Both were very cheap and yummy. A nice small place on Calle 37, great for lunch or light dinner. For a drink and maybe some Salsa moves, pop into the well-known Benny More nightclub. 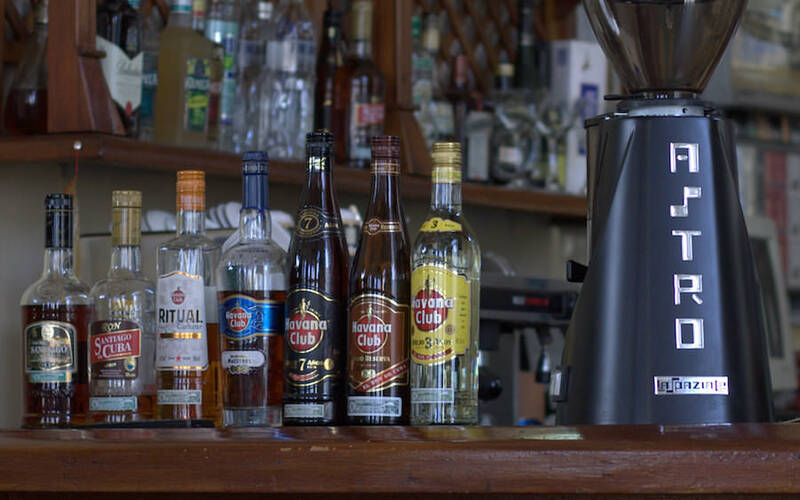 You should also never ignore the local bars and there are quite a few of them hiding upstairs in random buildings near Jose Marti square in Cienfuegos, just lift your eyes up and don’t be scared to walk in. There are also a number of good rooftop bars in Punta gorda and a nightclub in the Jaguar Hotel. Great, that place is looking so beautiful and have so many beautiful things to get fun. So stunning photos you shared of that beautiful place. Such a beautiful place. I would love taking a long walk in the boulevard observing the colorful facades and the historical buildings ! Beautiful guide. It’s quite extensive and detailed. I can’t wait to drive in one of those classic cars. I wish I owned one. 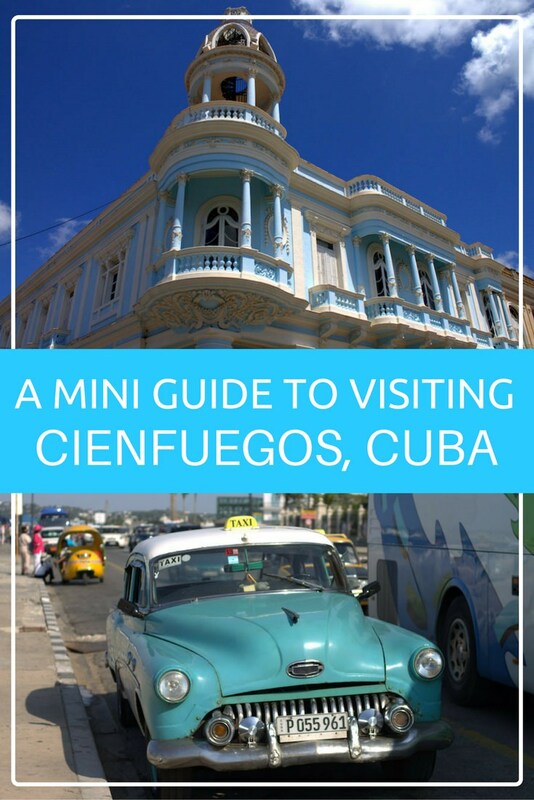 Ha ha we wish that too, those cars are amazing 🙂 Glad you found the guide useful, Cienfuegos is a beautiful place to visit in Cuba. Great photos, I took a miss on Cinefuegos when I was in Cuba in January. My parents had been there several years before and hadn’t been too keen so I opted to try a few smaller places instead. 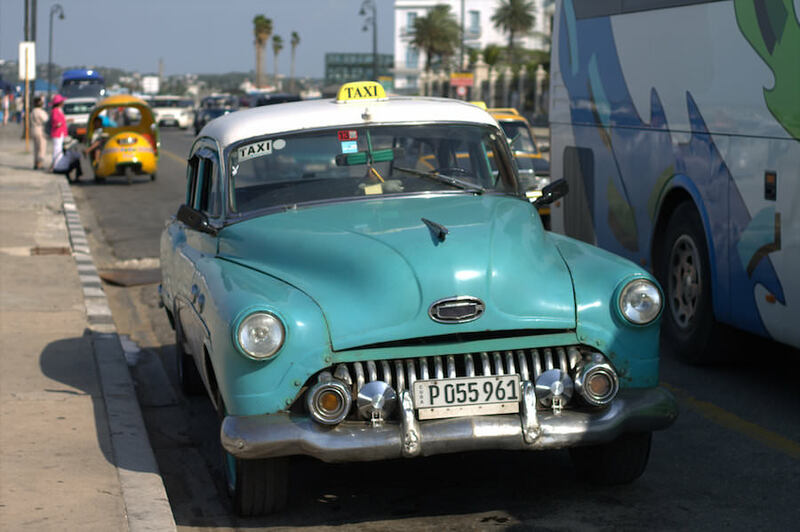 Great advice on the Viazul, what extreme headaches were caused by transport in Cuba. If I was more of a planner (and had have known better) I would have booked all my buses in advance from home online. Takes the mystery out of the trip, but those lines at Viazul were killer for my soul. Hi, you mentioned to avoid traveling in Cuba on Sundays? Does that also apply to taking Viazul buses across Cuba? I am thinking of taking a bus from Havana to Trinidad on a sunday but don’t want to get stuck with long delays or routes. Thanks for all the tips. It really helped us explore Cuba last year!